Should Christians Pursue the American Dream? My husband and I have recently started looking for a new house. We aren’t moving anytime soon. But when we first moved in here, to our cozy three-bedroom “starter house,” it was just the two of us with one little baby who wasn’t even walking yet. Now, we have three small children (who all have a LOT of energy! ), two pets, occasional guests, and my husband and I both work from home. So, it’s getting a little cramped! We’ve been checking out different neighborhoods, trying to determine which part of town we want to live in, how big of a house we need, what features we’re looking for, and what’s even available in our area. But… it’s also leaving me feeling pretty guilty too. After all, there are people out there who don’t have a home at all – much less a nice one. There are children out there literally dying because they don’t have enough food to eat and clean water to drink, and here I am dreaming of white walls and windows. Our families are excited for us. “You deserve it!” they say. “It’ll be so nice!” they say. But I still just feel like a selfish jerk. How can I have so much, when others have so little? While definitions vary, the “American Dream” is essentially the right of every person, regardless of race, ethnicity, gender or income level, to pursue a good/better life for themselves and their family through education and hard work. It’s the nice house, the nice car and the nice paycheck. It’s waking up in the morning and going to a job you love, then coming home to a family you can provide for without worry. It’s comfort, security, betterment and enjoyment – all because you got up, worked hard, and made it happen. And you know what? I believe they’re right. Here in America, we pretty much can and do have it all. Lucky us. …But what if that’s not such a blessing after all? So lately, I’ve been wondering… How should we, as Christians, view and relate to the American Dream? Is it okay for Christians to pursue the nice house, the nice car, and the nice paycheck? Is it okay for Christian to work hard with the intention of being wealthy and/or having nice things? If being wealthy were sinful, we wouldn’t see so many examples of great, God-fearing Bible characters who were. In fact, the Bible even tells us that wealth is a gift from God. In 1 Chronicles 29:12, David says “wealth and honor come from you,” referring to God, and in 1 Kings 3:11-13, we see that King Solomon’s wealth was a gift from God as well. Material blessings are a gift from God and it’s okay to enjoy them! That being said, just because God chooses to bless some people financially doesn’t mean that being well-off is always a good thing. In fact, the New Testament presents money in a pretty negative light. If our real goal in life is putting God first (and it should be), then it seems like money is a pretty costly distraction. So Which is It? Should Christians Be Wealthy? The good news is, money itself isn’t good or evil. It’s a neutral object. It’s just a piece of paper. Completely morally neutral. You could have a million dollars of it or two cents of it and still be an awesome Christian. As long as you came by it honestly, it truly does not matter how much of it you have. But what does matter is why you want it in the first place. Why Are You Really Chasing the American Dream? Sure, there’s nothing wrong with having the American dream, but why? Out of all of the goals you could reach for this year (either consciously or unconsciously), why would you choose to have more stuff? Is it to impress other people? Because of selfishness or greed? 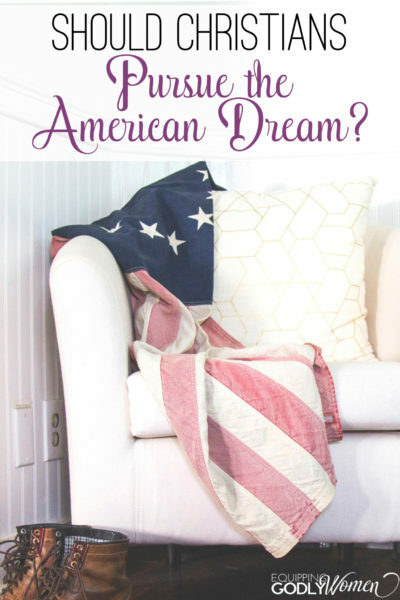 It’s a tough question to ask, but it’s so crucial: Why do you want the American dream? Why do you want more money or a nicer house? What is it about it that calls to you, really? What are you really trying to obtain? Are you motivated by pride? Or by the desire to be a good steward of the time and talent the Lord has given you? Are you selfishly hoarding more, more, more for yourself? Or are you committed to generously seeking out ways to bless and serve others out of your own abundance? Are you using your wealth to glorify yourself? Or do you go out of your way to use your time and talents to bring glory to God? Are you looking to money as your source of strength, security and safety, are do you trust God to provide? And secondly, what do you have to give up in order to get there? Because, realize it or not, gaining wealth does come with a cost. Will you spend more time working and less time reading your Bible? Will it mean skipping church on Sundays? Will it tempt you to lie to your spouse, to your family or to your boss in order to get ahead? These may not seem like a big deal now – or they may not even feel like options at this point – but when you start chasing wealth instead of God, it slowly but surely shifts your priorities whether you realize it or not. Still want to be wealthy? That’s okay. The world could use more rich Christians. After all, it’s hard to wipe out world hunger and find cures for diseases and bring people the resources they need if you don’t have any way of doing it financially. But rich, generous, God-fearing Christians can make it happen. Rich Christians can wipe out poverty, feed the hungry and still find time to volunteer in their local churches and around their community. They have the resources to do so. So, what does your heart desire? Are you chasing the American Dream? Why? I’ve been thinking about this a LOT lately, and yes, I want a nice home. But not for me. I want a nice home because I want a place for friends and family to gather. A place where we can share the gospel and model for people what a solid, God-fearing, Christ-centered family looks like. I want to do life with people. I want people to see my marriage and my parenting and say “Yes! I want that!” – not to be more like me, but to be more like Christ. To see that His way really does work, and that it really is worth all the effort. I want my kids to bring allllll their friends over. And I want to have a TON of foster kids someday. I just want to adopt them all and bake them batch after batch of chocolate chip cookies and tell them how much I love them, how much Jesus loves them and that it’s all going to be alright. Really. And every time I hear a radio commercial for Cure.org or Compassion International, or I get mail from Food for the Hungry or Water Mission, I just want to whip out my credit card and give them alllllllll the money without even batting an eyelash. Because while my kids are clamoring for their third breakfast, there are kids out there who won’t get breakfast at all, and that breaks my heart. And you better believe I’m going to work my rear end off until I make it happen. This is a struggle for me as well. I know my family is wealthy compared to most, and I feel guilty about it at times. I appreciate you pointing out that when we have a lot, we have a lot to give. We can be more generous. That’s one of the big reasons I want to earn and save well. And I love your dream of foster kids! Using your home to minister to needy kids and even your kids’ friends is awesome! Thanks! And yes, that’s what makes me feel better too. I don’t want to amass “stuff” just to hoard it. I want to make a difference. And in order to do that, I need resources. As long as you can still maintain your tithe and offerings and are in true need for the change, then I say go for it. Yes, those things need to come first for sure! I have struggled with the same things! At this point in my life, I really want to make more so I can give more. As more and more times passes, I believe that it has become more and more of my desire. I truly believe that (generous) Christians need to have more so that we can help advance the kingdom of God. I’m tired of the idea that Christians shouldn’t have much because “that’s not humble.” It’s frustrating. So we shouldn’t have much, but the drug dealers should?! I’ve heard this sentiment way too many times in my life and it’s still the sentiment that sometimes holds me back. It’s not because I believe it anymore, but because I’m sometimes scared of what people will think of me. I know exactly what you mean. I’ve never heard people say anything to me or directly in front of me, but you always pick up on a little bit of the scorn people have for pastors of mega churches and the like. It’s difficult figuring out where the line is. Although, really, who cares what they think? God’s opinion is the only one that matters (as long as we aren’t leading people astray or giving Christians a bad reputation, I guess). I have worked all my adult life. I have cried over missing a lot of important moments because I was told I needed to work, that we could not survive on one income. I worked all through the raising to adulthood of one child and see the painful outcome of all those missed opportunities. So, my American dream looks much different. I want to finish paying off my little home and go home permanently, to my younger children, care for my aging parents and 101 yo grandmother, help with church functions and grow something beside weeds on our farm. The last thing I am concerned with is wealth, status, etc. I want that commodity so precious that no currency can buy it. …Time. That’s a really great perspective. We can always get more money, but we can never buy more time. Thanks for sharing! This is SO good Brittany (and I’m not American….applies to us all!). I love your big dream and your compassionate heart. Amen to more rich Christians who can use their money to make a difference. It’s like God said to Abraham…I will bless you to make you a blessing. Every blessing to you Brittany…and may you find and enjoy a wonderful new home. Aww thanks, Jo! I just had to write “the American dream” because I’m not sure if other countries have quite the same “pull yourself up by your bootstraps and get to work!” mentality that we have here. Or at least… we did until recently. I actually think it’s shifting now. You know, I feel like God has been throwing this concept of money in my face a lot lately and I have kind of just ignored it. I grew up in a fairly wealthy household but it was always unhappy; and that is because my parents focus on the getting of money for selfish desires and have passed that trait down to me! God please help me desire money for your kingdom Lord! Help me to become deeply rooted in that desire! In Jesus name AMEN! Thanks for this post-it has really cleared some issues up about money. It’s an important topic! And one that isn’t discussed enough. I think, for me, the biggest way to motivate myself to action and selflessness is just to spend more time focusing on thinking of ways to help than things to acquire. For example, if you are on Instagram – is your feed full of new houses and fashion and tons of things for “me me me?” If so, you could follow more people who inspire you to want to be more generous. We are THAT Family is a great blog along those lines, as are any nonprofits like Compassion International, Food for the Hungry, World Vision and others. It’s insane how much stuff is going on around the world that we have NO idea about. Wow, thank you for all those suggestions! I am always looking for positive reads online and great places like the ones you mentioned to work for! I can especially relate to your point that money can be a distraction. That’s the biggest struggle I have, whether it’s worrying about money or striving after it. My American Dream is to shine the light of Jesus in every sphere of influence God provides. With every increase, I want to honor Him more. And with every decrease, I want to be just as thankful, leaning even more on His sufficient grace. Thanks so much for referencing this article in your message today, 10/12/17. I have been feeling guilty for so many years for having more than most. Your article helped me to see that what I do have, comes from God. And that is NOTHING to feel guilty about!!! And that, He has given me this for his glory. Now, how can I give to further His kingdom. Thank-you so much. I really enjoy your thought and heart provoking questions. Oh Brittany, this is where I have felt so lost lately…I do at times feel so guilty for what I have and I know many others don’t, now my husband makes good money but after all the bills and things are paid, groceries are bought and our tithe is tithed , 90% of the time there is nothing left over to give away and I would like to help people and bless them.Just recently God provided my husband with a side job that is helping us pay off a debt, but all in all i so badly want our own home. Before i felt good praying about it and claiming one for our own now i feel so guitly for asking for it. We leave in an ok area in a small kind of cramped duplex, I really want a home with more space to have family gatherings, minister to people and most importantly have the room for another baby, right now where we live there is no way another baby would fit here. Why do i feel so guilty when i pray for a home that has space for my 2kids and another baby? God has been teaching me contentment and gratitude but I just dont get how a few months ago i felt good about it in my spirit claiming it in the name of Jesus now i feel like i shouldn’t be asking for it? Im very confused but either way i hope God will help me bless others with the little or much he gives me. Yeah, it’s tricky and I’m right there with you. I think it all comes down to our motivation and gratitude. Are we trying to use our resources well, for good, Godly purposes? Or do we just want more, more, more for selfish reasons? Or even just because we’ve been taught that “more is better” when it isn’t always. I don’t think there’s a 100% right or wrong or that our motives will ever be completely pure, but it is definitely something we have to keep examining our hearts over. Hello Brittany! I’m a Christian blogger from Nigeria also raised a Baptist and a Royal Ambassador! I think Christians getting rich isn’t a sin but why we really want it is what matters. We are blessed for a purpose which is that through us others might be blessed! People should see us and be attracted to the light they see in us. I think is really time for we Christians to rise in this generation of ours to change the world and bring more people to the light; but how can we achieve this if there’s nothing we have to utilise this change? Acts 4.33,34 – “And with great power gave the apostles witness of the resurrection of the Lord Jesus: and great grace was upon them all. And meanwhile when in search of money, properties and so on, we Christians should be careful lest we ourselves fall into the trap of greediness! Because this is where so many Christians have missed it and lost it all. Thanks for this great idea, Mrs. Brittany. Many Christians think it’s ok to accumulate wealth or become rich as long as their motivation is pure and it is for the kingdom of God. Did He say, “don’t lay up treasures on earth unless you want to do it for the kingdom”? At what lengths will we go to make excuses for our own greed?